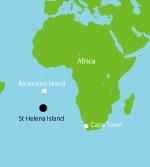 Uninhabited when first discovered by the Portuguese in 1502, St. Helena was garrisoned by the British during the 17th century. It acquired fame as the place of Napoleon BONAPARTE's exile, from 1815 until his death in 1821, but its importance as a port of call declined after the opening of the Suez Canal in 1869. Ascension Island is the site of a US Air Force auxiliary airfield; Gough Island has a meteorological station. The economy depends largely on financial assistance from the UK, which amounted to about $5 million in 1997 or almost one-half of annual budgetary revenues. The local population earns income from fishing, the raising of livestock, and sales of handicrafts. Because there are few jobs, 25% of the work force has left to seek employment on Ascension Island, on the Falklands, and in the UK. The coffee here is special and has a excellent quality. Indeed, the growing conditions of the island are also ideal for the coffee production, the volcanic origin of the island has provided a rich soil and the mild maritime climate supports the agricultural incidents excellent. Coffee of St. Helena is overall very well balanced. He has a very meaty body with a slightly chocolaty, rich flavor that is refined by a sweetish note. His delicate mild flavor flatters the coffee drinkers also additionally. The slight acidity with its fruity nuance attenuated round out the flavor of the coffee.